Until this past Saturday, I had never stepped foot onto an amusement park or been on a roller-coaster ride. Saturday will never be forgotten. In my book of awesome days, it is a definitely in the top two and strong contender for 1st place. 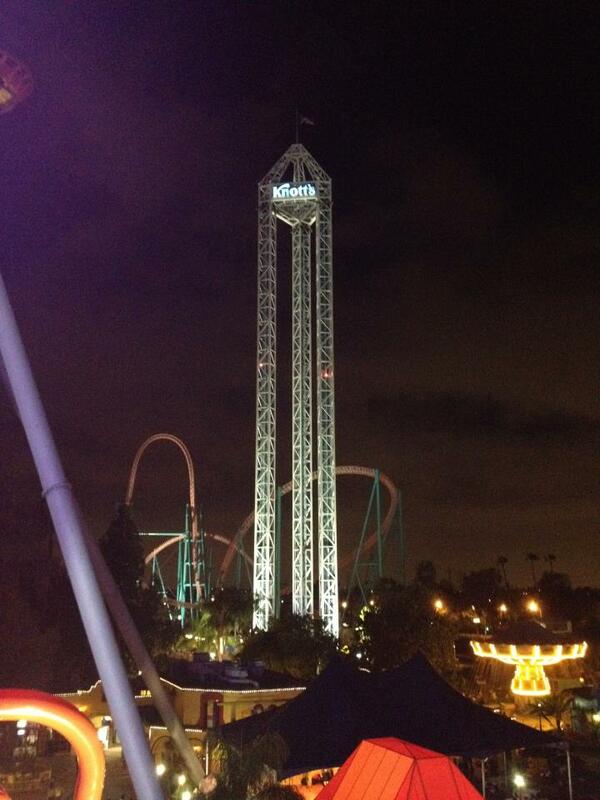 When my friend Liliann invited me to come with her and some friends to Knotts Berry Farm, I immediately agreed. Yes, I was apprehensive but excited. I had no idea what to expect from a roller coaster ride. I knew it would feel similar to some of my driving stunts but knew that I wouldn’t be able to control the ride. My friends were rather gleeful to be going with me on my first visit and that really didn’t do much to assuage my slight fear. When I stood in line to buy my pass, screams filled the air, another factor which did little to comfort me. I’m not going to lie, my greatest fear was that I might puke, and then I was a little worried about my pride should I scream. Puking in public is obviously disturbing. Puking in public (in front of your friend who is a girl) is not a bright idea at all. I figured the less I ate, the probability of me puking would probably decrease. So on Saturday morning, my breakfast consisted of a couple Twinkies and some water. I met up with Liliann and her friends at their house, where we piled into our friend’s car and headed off to Knotts Berry Farm. During the ride there, my friends intermittently teased me with terrifying stories of the rides and then reassured that the rides weren’t all that scary – all of which kept me on edge. After gaining admittance, my friends decided to be nice and start me off with Camp Snoopy. My first ride was La Revolucion. Liliann sat out on this ride, so my other friend Cynthia became my ride buddy. As we watched the floor drop to give our swing clearance, Cynthia asked me “are you scared yet?” and I was. The harness was so permanent which was both frightening and calming. Frightening because it was too late to escape the ride, calming because I was half-way sure it would not let me fall. I neither puked nor screamed on that ride, so I was feeling rather good about myself. The next ride was the Windseeker. I don’t like heights but I enjoyed this ride. Besides, the horse-drawn carriage rides, it appeared to be the tamest ride on the park. Now I felt cocky, so my friends made a beeline for Supreme Scream. This ride ejected my cockiness and any other confidence I had built up. The whoosh of air being released before the insane drop will forever haunt me. The ground races up to grab you, your insides are temporarily relocated, and there is nothing you can do……..except scream. After several moments of recovery, we headed to the Boomerang ride, where I had my first taste of loops. After being pranked in line by my friends, we boarded the little green train. I again was unsure what to expect, so I concentrated on my shoes through the first loop. When I realized I was still alive, I peeked out at the upside-down world rushing by me. That is an incredible feeling. From there we went to the Mine Ride, followed by the Silver Bullet. Once we got done with Silver Bullet, it was getting dark. The girls bought me a hot chocolate as we waited on the long line for Ghost Rider. It was dark and Ghost Rider didn’t seem so scary when we started, so Liliann dared me to put my hands in the air through the first drop. I did, but when she warned me to hang on, my pride got the better of me and I kept my hands in the air. I think she screamed for the both of us. The drops were severe, the tracks were rough, and we were thrown from side to side with the hairpin curves. Our last ride was Montezooma’s Revenge which was really fun and then we ended the night by just running along the now empty walkways and posing for random pictures as the park neared closing time. On our way out, I upgraded to an annual pass and my friends and I made plans to return. I will never forget Saturday. It was insane fun with awesome friends.